Are any of these boosters currently in your portfolio? The latest earnings season will soon fall behind the horizon. As ever, we'll likely be in for a relatively dark period of several months, in which dividend raises will be more the exception than the rule. America's most popular coffee slinger Starbucks (NASDAQ:SBUX) is adding a jolt of caffeine to its quarterly dividend. The company has declared that its new payout will be $0.25 per share, a sturdy 25% higher than its predecessor. We shouldn't be surprised by this. The freshly-caffeinated dividend was announced along with the company's Q4 and fiscal 2016 results, which were quite encouraging. In fact, Starbucks notched a new record for per-share profitability in the quarter, and for revenue and operating profit for the fiscal year. SBUX Net Income (TTM) data by YCharts. The former period saw the company lift its bottom line by 23% on a year-over-year basis (to $801 million), on revenue that advanced by 16% to just over $5.7 billion. Both figures beat estimates, although same-store sales growth of 4% was nearly one percentage point shy of both average prognostication. Meanwhile, those top and bottom-line numbers weren't the only ones that rose. Free cash flow stood at over $3.1 billion at the end of the fiscal year, almost 30% higher than at the end of 2015. The company likes to spend heavily on its dividend and on share buybacks, plus it's managed to sustain a history of generous raises stretching back to 2010. These factors augur well for the future of the payout. Starbucks' upcoming dividend will be paid on Dec. 2 to stockholders of record as of Nov. 17. At the most recent closing share price, it would yield just under 1.9%. 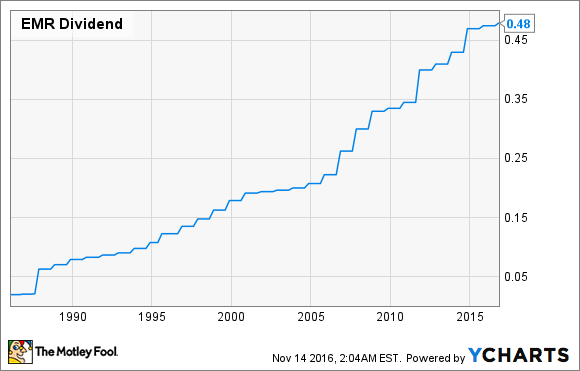 That's slightly lower than the current 2.1% average of dividend-paying stocks on the S&P 500. Our next raiser is industrial conglomerate Emerson Electric (NYSE:EMR), which is one of the few, the proud, dividend aristocrats -- the elite group of stocks that have increased their payouts at least once annually for a minimum of 25 years running. Emerson Electric's latest boost is a modest one, by 1% to $0.48 per share. EMR Dividend data by YCharts. 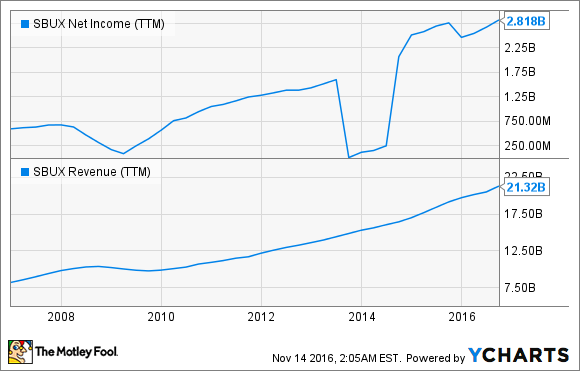 This continuation of the streak of dividend raises is good news. The bad news is, due to the struggles of the energy sector (collectively a major customer), the company had a tough fiscal 2016, and it anticipates 2017 will also be challenging. 2016 ended on a bum note, with Q4 revenue and net profit both seeing notable year-over-year declines -- although the former handily beat analyst estimates. Meanwhile, the company's guidance for per-share profit in 2017 came up short -- it's expecting EPS of $2.35 to $2.50, while analysts had been projecting $2.55. Yet for two reasons, I don't think these problems will lead to the end of the company's dividend raising streak. First, in spite of the revenue and profit declines, operating and free cash flow improved nicely in 2016 (by 14% and a hearty 32%, respectively). And second, as a grizzled veteran in its various businesses, the company has faced tough times before, and survived to tell the tale. I'm not worried about the future of this payout. Emerson Electric's new distribution is to be handed out on Dec. 9 to investors of record as of Nov. 11. It would yield a theoretical 3.5% on the current share price. Deal-making retail REIT General Growth Properties (NYSE:GGP)is about to make its investors slightly richer. The company just declared a 16% hike in its quarterly dividend to $0.22 per share. This comes at a busy time of deal making for the REIT. Recently, it was part of a consortium that bought beleaguered fashion retailer Aeropostale, while a few weeks later -- on its own -- it scooped up five stores from the eagerly divesting Macy's. These moves come on the heels of a number of asset sales made by the REIT. Collectively, these helped inflate the company's net profit in its Q3; it rose to over $674 million, an over five-fold increase from the same period the previous year. By contrast, revenue dipped by 5% (to $554 million) over that same stretch of time, while adjusted funds from operations slipped by 1% to just over $336 million. Given those not-scary declines, I'd say the REIT is weathering the struggles of the retail sector fairly well. Those recent deals show that it's willing to be creative in finding ways to grow and/or shore up some of its clients. If I were an investor, I'd be a bit concerned about its high levels of debt, but these have been coming down of late, while free cash flow has seen a pleasing increase. I feel this dividend is safe for now. 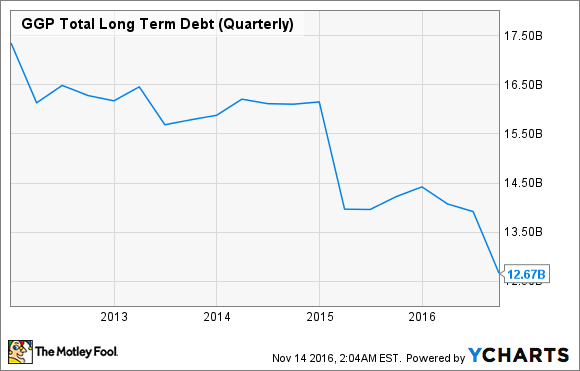 GGP Total Long Term Debt (Quarterly) data by YCharts. General Growth Properties will dispense said distribution next Jan. 6, to shareholders of record as of this coming Dec. 15. At the current share price, the raised amount would yield just under 3.5%.